If it’s necessary to default to text formatting for your email client rather than HTML, use Calibri, Arial or Verdana fonts for your email signature. The font for the body portion of your email should be the same as the chosen font for your signature. 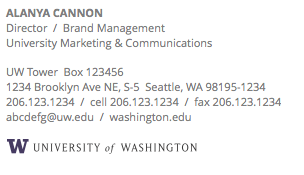 It’s not possible to use the left aligned University of Washington signature graphic at the end of your email signature with text formatting, so please use uppercase letters in spelling out UNIVERSITY OF WASHINGTON at the end of your signature. Keep the size of the font in your signature the same as what it is in the body of the email for Your Name and UNIVERSITY OF WASHINGTON and reduce the font by 1 size for the middle section of your signature. Using bold font for Your Name and UNIVERSITY OF WASHINGTON is optional.